Is it possible to make beautiful music out of garbage? Inspirational conductor Charles Hazlewood is going to find out. This 90-minute documentary follows him challenging a group of the UK's top instrument makers to transform junk, broken furniture and the contents of road-side skips, into instruments worthy of a place in a symphony orchestra. For the first time ever, an entire orchestra of 44 working instruments will be built from scrap. Two couples - Sam and Rachel from Wigan and Tony and Serena from Liverpool - have never met, but they do have one thing in common. They are both planning to tie the knot. But are they marrying the right person? Both couples take a close look at each other’s relationships and at the end of an intense week together, each couple will ￼￼deliver a verdict on the other couple’s relationship... two couples go from nearly weds, to really weds? Two couples - Sam and Rachel from Wigan and Tony and Serena from Liverpool - have never met, but they do have one thing in common. They are both planning to tie the knot. But are they marrying the right person? In this brand new format for BBC3 they're going to find out. Both couples take a close look at each other’s relationships. UP FOR HIRE LIVE is a unique interactive series for BBC Three, which aims to help young people who are out of work, or in temporary jobs, to start a new career. ﻿Recent government figures show that unemployment amongst 16 – 24 year olds has risen to nearly one million, so this series couldn’t be more relevant. Business leaders and celebrity guests will be taking part to share their stories and highlight the reality of the world of work. 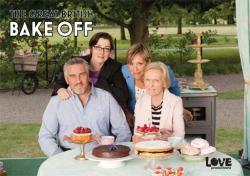 The Great British Bake Off is back. Over eight weeks twelve of the country’s best amateur bakers face increasingly difficult challenges as their cake-baking, pastry, bread-making and patisserie skills are tested to the limit. The series is presented by Mel Giedroyc and Sue Perkins and the challenges are devised and judged by legendary cookery writer and baker Mary Berry and acclaimed Master Baker Paul Hollywood. The series is presented by Mel Giedroyc and Sue Perkins and the challenges are devised and judged by legendary cookery writer and baker Mary Berry and acclaimed Master Baker Paul Hollywood. We love it, we hate it, but we never stop talking about it. The Great British Weather is the top topic of conversation in the UK, and this new show celebrates it. Comedian Alexander Armstrong, BBC weather presenter Carol Kirkwood and BBC Watchdog presenter Chris Hollins present the series live from a different place in the UK each week. In this film, parents of children in a Leicester primary school are given a rare opportunity to see how their children really behave in class. The classroom of a year 4 class in Humberstone Junior School is rigged with fixed cameras and filmed over the course of one week, and the parents watch it all, allowing the parents to witness first hand the behaviour of their children at school. It is a brave project where teachers and parents both have something to learn, as the private world of the classroom is uncovered. In this film, parents of children in a Leicester primary school are given a rare opportunity to see how their children really behave in class. The classroom of a year 4 class in Humberstone Junior School is rigged with fixed cameras and filmed over the course of one week, and the parents watch it all, allowing the parents to witness first hand the behaviour of their children at school. It is a brave project where teachers and parents both have something to learn, as the private world of the classroom is uncovered. Hundreds of thousands of economic migrants risk their lives and cross continents to try to illegally enter Britain every year. In this ground breaking film two reporters set out to immerse themselves in the journeys that migrants take along the most popular and dangerous routes to the UK.